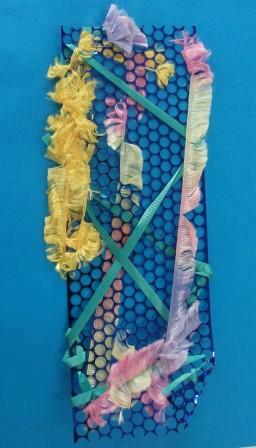 Weaving is a great activity for developing fine motor skills and eye hand coordination. As the year has progressed so too have my preppies skills in this area. 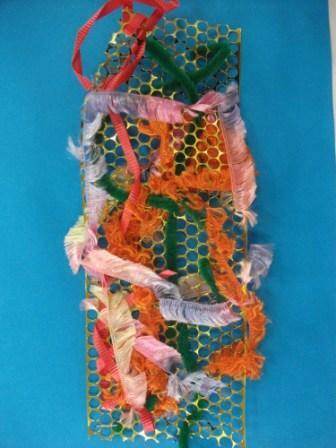 To challenge these skills we did some free weaving using textured wools, ribbons and pipe cleaners through metallic honeycomb mesh. The children found this quite tricky as the holes in the mesh are small but they were very persistent and really proud of their achievement. 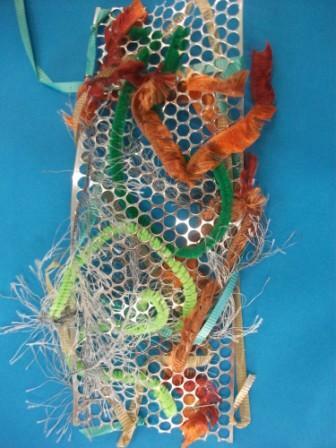 The mesh is readily available to the children on the collage trolley and now they often weave things through it to add to their creations. An easier way to do this activity would be to use a bodkin. To display their weaving, we hung them from a piece of tulle over the ceiling fan, using more ribbon.